A faithful collaborator of Shuji Terayama, Henrikku Morisaki is a behind-the-stage artist profoundly involved in a number of Terayama's theater and cinema projects. Having worked as an assistant director, production designer and sound supervisor, he has also acted in experimental performances that blur the borderline between cinema and real life. Here, he reminisces about Terayama and his own involvement as a member of the Tenjo Sajiki theater troupe. Can you tell us about your youth and describe how you came to know Terayama? I was born in 1949 on the island of Awaji, right in the middle of Japan. When still at school, I read Terayama's literary works, such as Throw away your books, rally in the streets and Invitation to escape. I've also followed a number of television and radio productions based on Terayama's scripts. At the time, I was already very interested in his work, and was intrigued enough to look for personal contacts. I feel that Terayama's works are very documentary in nature. In fact, they are in the form of questions for the audience to answer. His radio programs, like the series for young girls, projected a kind of poetic spirit I had never encountered anywhere else. I found those words extremely beautiful. In my last school year, I read some reviews, in which Terayama presented selected poems sent to him by the readers. Through these poems, I felt the entire youthful energy of the epoch assembling around him. Hideaki Sasaki was one of the authors in these reviews, and later he became the protagonist of Throw away your books. Like Terayama, he was born in Aomori, in the north of Japan. Terayama advised him to come to Tokyo so that they could work together. I had also written poems and sent them to the review, but unfortunately they had never been selected. At that time, I was very interested in theater, and followed all the theater news. Thus I learned about the creation of the experimental troupe Tenjo Sajiki by Terayama, in conjunction with other artists such as Aquirax Uno, Tadanori Yokoo and Eiko Kujo (his future wife). That's how I decided to join them, and how I escaped to Tokyo. I left at the age of 17. Originally, I wanted to become an actor in this troupe, but the others found me too loud and awkward for an actor. I was thus allocated to work with the sound personnel. For almost 17 years, I worked very closely with him [Terayama] in all his creations, theatrical and cinematic alike. I've worked with sound, as an assistant director, and as a graphic designer. In the end I was ready to do anything for him. I also appeared in films like Laura  and Der Process. When he needed an actor ready to strip, they called me. That's all. And you have exercised for almost 30 years to maintain the same physique as seen in the films! What about the day-to-day work of Tenjo Sajiki? How did it go? In the beginning, Terayama relied considerably on external personnel as actors and technicians (some came from renowned professional troupes) and other artists such as Tadanori Yokoo, Aquirax Uno, etc. Akihiro Miwa was also there. Afterwards, Terayama started to employ non-professionals, like me, and to contemplate the different options for joint work. It's from this moment on that the documentary aspect started to take on more and more prominent place in the theater pieces, contributing to our artistic evolution. We also engaged in street theater productions, where only a part of the audience was aware of what they were actually watching. Later, we gave up performing on classical theater stage altogether. We preferred to perform in public places, constructing five or six sets, amongst which the audience had to circulate without knowing where the play started; they had to choose for themselves what to see. We had been doing everything to destroy the classical theater forms, and we'd finally broken through these constraints. At that moment, Terayama became ill. Because of that, we were forced to return to the usual theater stage, where we produced two more plays more classical in nature, but without story or plot. One can say the same about cinema: for Terayama, his works were questions and not answers. They had to be completed by the members of the audience. Music plays an important role for Terayama. How was it integrated in his world? In the early days of the Tenjo Sajiki troupe, we were inviting musicians from outside. Later, J.A.Seazer joined us. He wasn't educated as a composer at all, but he was asked to write music. That's how he became a musician; one can hear his first pieces in The Heretics. He learned to play guitar, and he had studied a lot to be able to compose. Later, he was in charge of most of the music in Terayama's works. There was also Michi Tanaka, the secretary of the troupe, who had a musical education. She contributed some music for the experimental shorts. Contrarily, the music for the feature films was composed collectively. Around ten musicians worked on the music for Throw away your books. How was his work received, in Japan and abroad? Terayama was perceived as extreme avant-garde, and many could not accept him. On the other hand, he was supported by many among the youth. His aesthetics mixed Japanese and Western influences, and his art was extremely visual. People were always interested in this aspect. Abroad, we made our first performance at the Festival of Experimental Theater in Frankfurt, and later we staged two plays in Nancy. In Amsterdam, the director of the Mickery theater showed a great appreciation for our work and kept inviting us every year; we've performed original plays there. And in Brussels, 30 years ago, we performed a play at Atelier 210, which at that time was called Atelier 212, I believe. What was Terayama's place in the cultural context of the epoch? Can he be associated with the Japanese New Wave? Terayama cannot really be seen as a part of the New Wave as it emerged 10 years before him, at Shochiku, for example. Terayama started to make his films with the help of ATG (Art Theatre Guild), which aimed at promoting modern and unconventional cinema. This company was ready to engage non-professional directors. His first film Throw away your books was produced by ATG. Terayama had completely broken the classical cinema language, arranging everything in an even sequence, except for scenes cut in a classical manner by the assistant director. Terayama continued to direct very avant-garde films without worrying much about audience response. He believed that his films would be appreciated by the audience, and was never anxious. Later, he started to shoot experimental films on 16mm. There were many films like that at the time, usually very boring. He wanted to annihilate this image and create ‘non-boring’ experimental cinema. As I told you, for Terayama, half of the film belonged with the viewers. It was extremely important to engage the audience. From that point on, one can say that he stayed focused on delivering a spectacle. Terayama assigned a lot of importance to audience participation and improvisation. How could this be accommodated in his autobiographic, personal, masterful films? To make a movie, he evidently did write a screenplay to serve as a guideline for all involved. But, in Throw away your books, for example, the protagonist kept receiving new and unexpected scenes every day. In his films and theater plays, he never wrote the final scenes, so that the actors and the technical personnel had no idea how it was going to end. The work required a certain amount of tension, and we never felt secure (laughing). For example, in one of his films, The Two-headed Girl, the screenplay merely remarks: "There are no more shadows." The lighting personnel were forced to think how one could make all the shadows disappear. This one-sentence instruction required a lot of thinking. Sometimes, there were things impossible to realize, materially or technically. But he would say: no, it is possible and it has to be done. For example, for his last film, Farewell to the ark, he indicated that the characters were insomniac, which was very difficult to represent visually, and he was asked to modify the screenplay. How did he put together his ideas, his recurrent and personal themes? In theater as much as in cinema, Terayama often approached the same themes from different angles, so as to show that there are many possibilities, and that every spectator has the right of his own interpretation. He also wanted to emphasize that the possible responses were many. In a number of his works, the question "Who am I?" is repeated. I interpret this not as an examination of a unique self, but rather like: "I have split up, and there are so many selves that I know not which one is really me." In the film The Others scripted by Borges, the father figure splits up and the protagonist sees him all over the screen, even other characters make him think of his father. We thought a lot after watching this film with Terayama. 3. An entire section of Terayama's video-correspondence with Shuntaro Tanikawa (Video Letter) is dedicated to asking "Is it me?" and rejecting various identities in response to this question. Terayama finally remarks: "One who cannot find the answer: would that be me?" Was Terayama satisfied by his films? Did he see them as a suitable form to represent his ideas, in comparison with theater, for example? In general, I believe he was satisfied with his films, except perhaps the last one, Farewell to the Ark, which was made when he was already seriously ill and wasn't sure which direction to pursue. Originally, the screenplay for Farewell to the Ark aimed at a 4-hour long movie, but in the end, we've only filmed enough footage for 3 hours. During editing, he did not like certain scenes and cut them. Finally, the film shrank to less than 2 hours. When we were looking at the rushes, he was so ill that he kept falling asleep all the time, and he was saying it was because the scenes were boring. He kept demanding "cut! cut! cut!" without a pause. Why are there two versions of Emperor Tomato Ketchup? Terayama thought that the film was too long and asked Takase Uzui, the assistant director for Throw away your books, to prepare a shorter and more cinematic version. That was his choice. I personally prefer the long version that lasts over an hour. What was the philosophy of his experimental shorts? The shorts were motivated above all by the desire to experiment. For Laura, the question was "How can one enter the screen?". For The Two-headed Girl, we wanted a film only showing shadows. He wished to make experimental films that would not bore the viewer. Terayama was a very busy person, but whenever he had some time, he would ask his cameraman to help with the shorts. 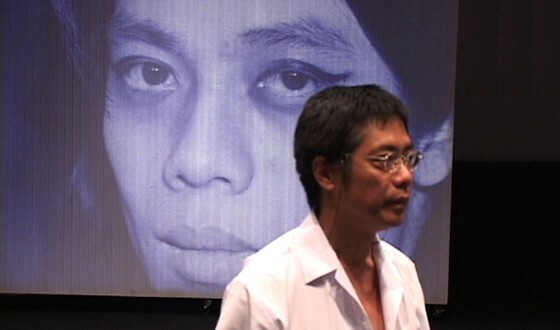 Terayama was always interested in new kinds of media when they appeared, in video for example. He was also the first one in Japan to make use of an overhead projector in his cinema, which he manipulated himself. What did Terayama think about the adaptations of his screenplays by other directors? Early on in his career, he wrote a screenplay for Masahiro Shinoda, but he did not like the film. The final result seemed like an imitation of Elia Kazan's On the Waterfront: too New-Wave-like. He co-wrote screenplays with Shinoda, except for Buraikan, which he wrote alone. I think that the films written by Terayama for Shinoda are not sufficiently impressive. For example, there is a scene showing fireworks in ancient Tokyo, where Shinoda did not really bother to stage real fireworks. For me, it does not appear satisfactory. Among Shinoda's films, the one I like most was not written by Terayama. It is the one for which Kiyoshi Awazu worked, a film called Double suicide, adapted from a Kabuki play. Terayama has also scripted a film by Susumu Hani called Nanami: First love, and the result was likewise disappointing. In the film, there is a small girl, Nanami, who comes up with a riddle: "What remains when all the layers of an onion are peeled? ", and the answer is "Tears." All these words are extremely poetic, and it is this poetic vision that Terayama wanted to transplant onto the screen. But the result was an obscene, sado-masochistic film, failing entirely to convey the poetic vision of the screenwriter. Since we were so dissatisfied with this movie, we decided to make a different version, bearing the same name and featuring the same characters, but in the form of a music record. What is the fate of Terayama's legacy? In Japan, there are sometimes TV broadcasts of his films. We also organize festivals dedicated to his works every year. His theater plays are also staged. La Marie-vison is currently performed in Tokyo, in Roppongi area. I helped with the premiere performance, two days before coming here . 4. Henrikku Morisaki is a stage manager for Tenjo Sajiki plays produced at present. It's rather difficult to obtain prints of Terayama's films. Why is it? How is it that the independently-produced films are distributed today by Toho, which does not make much effort to make them broadly available? What happened to Tenjo Sajiki after Terayama's death? Terayama passed away in the month of May (1983) when we were on tour. We played a few more scheduled performances in Osaka, but afterwards, Keiko Niitaka, a principal actress of the troupe, refused to continue the tour without Terayama. We cancelled the subsequent performances and soon realized that we were unable to go on. We thus proclaimed the dissolution of Tenjo Sajiki in July of the same year. In August, J.A. Seazer, the musician, and some other members founded a new troupe called Banyu Inryoku (Universal Gravitation). Personally, without Terayama, I didn't know what to do anymore, and I decided not to participate in this new endeavor. And what turns did your later career take? After Terayama's death, in June, his mother asked me to become her adopted son, and that's how I turned into Terayama's adopted brother in official records. Terayama had such great importance and bearing on our stage productions that I had serious difficulties to proceed on my own. It took me fifteen years to regain autonomy and the power to say what I was thinking. After his death, I became an assistant director for a number of films and theater plays, as a continuation of my work as Terayama's assistant. It's often said that the job of assistant director is a transitory stage before becoming a director. But I think I am really made for this job. It's probably hard to find someone who has spent as many years as myself working as an assistant director! It's rare enough to warrant a documentary about me, already 3 years in making with almost 100 hours of rushes. The director says it must be completed next year, but I don't believe it! (laughing) I've also directed some films of my own, but always on video. Other than that, at present, I take care of the sound for the theater of the great actress Kayoko Shiraishi, and I am also the artistic director for the photo books by Nobuyoshi Araki, which you should certainly know. Interview conducted by Laurent Tenzer at Cinema Nova in Brussels on October 12, 2008 as a part of their Terayama Retrospective. Translated by Oleg Evnin.